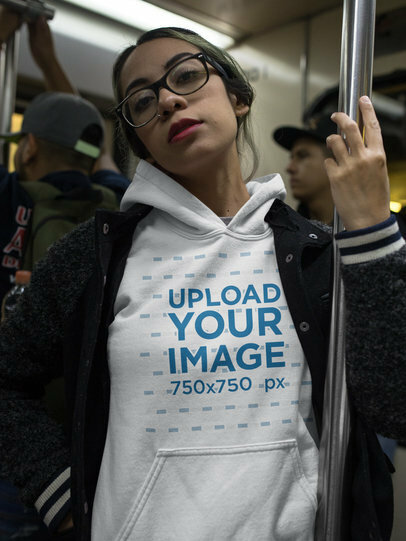 Take a look at this awesome template featuring a pullover hoodie being worn by a girl while in the metro, it's a great option for you to showcase your latest designs for hoodies in a better way! Just choose a color for the sweater with the HEX tool on the right, then drag n' drop your design image file over the upload button on the left. Simple, wasn't it? Try another Crewneck Sweatshirt Template! 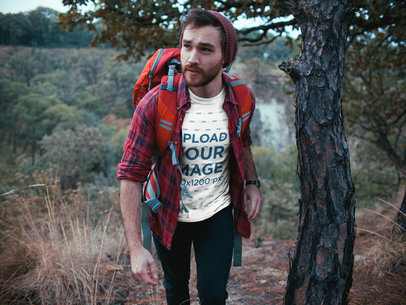 Use now this awesome template featuring a man wearing a tshirt while trekking at the mountains, it's a great choice for you to showcase your latest designs for tees in a better way! 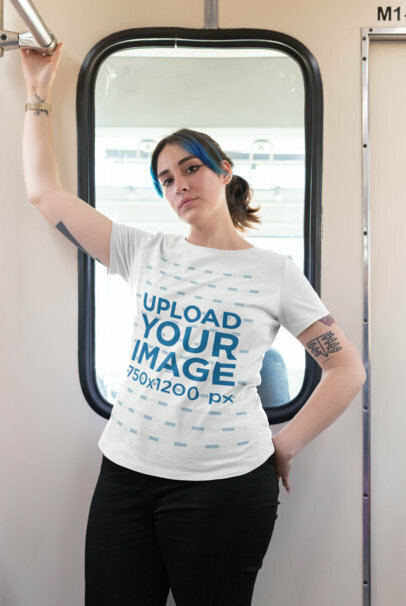 Use the HEX tool on the right to choose a color for the tee, then drag n' drop your design image file over the upload button on the left side of the page. Try another T-Shirt Mockup! 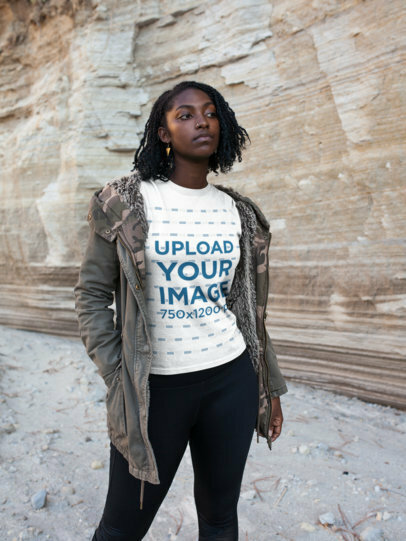 Use this awesome mockup featuring a black girl wearing a round neck tee and a military green jacket visiting a canyon to promote your latest designs for t-shirts and make your income grow! Showing photorealistic images to your audience will help them feel more engaged with your brand and designs. 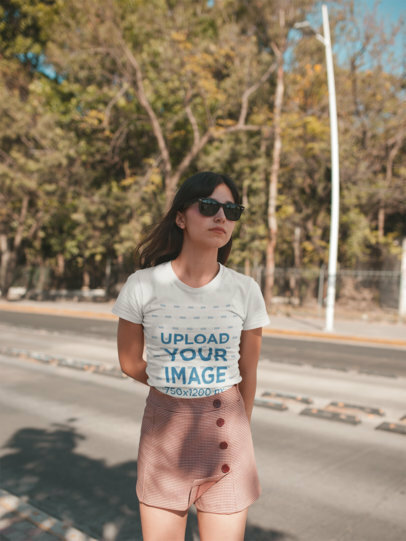 Start now by choosing a color for the garment with the HEX tool on the right, then drag-and-drop your jpeg or png image file over the upload button on the left. Try another T-Shirt Mockup! 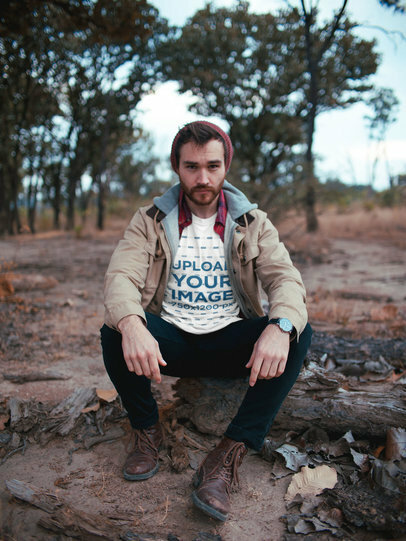 Use now this awesome mockup featuring a man crouching and wearing a round neck tshirt while outdoors, it's an excellent choice for you to market your designs in a more photorealistic way! 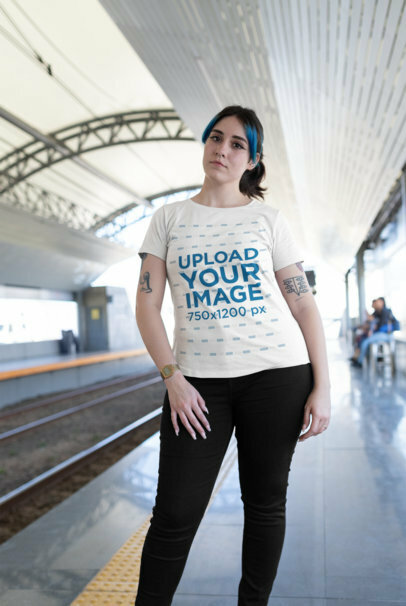 Use the HEX tool on the right to choose a color for the tee, then drag-and-drop your design image file over the upload button on the left. Try another T-Shirt Mockup! 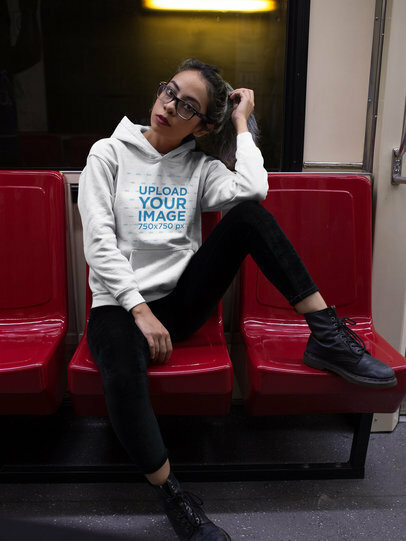 Use this gorgeous visual featuring a hipster girl wearing a pullover hoodie while sitting down in the metro and showcase your latest urban designs in a much better way! Using realistic visuals will help your audience know how your designs look like in real life. 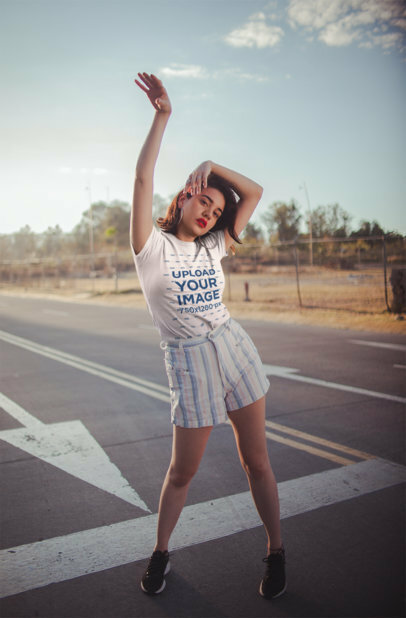 The menu on the right side of the page will let you choose a color for her garment, then drag-and-drop your jpeg or png image file over the upload button on the left. Try another Pullover Hoodie Mockup! 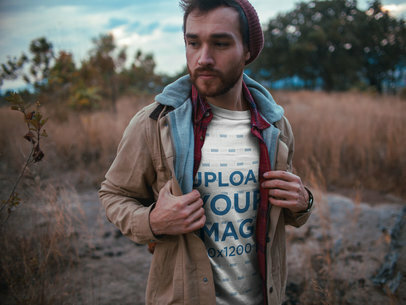 Use now this awesome mockup featuring a scared man walking outdoors while wearing a round neck t-shirt and make your revenue grow with awesome visual assets! Use the HEX tool on the right to choose a color for his garment, then drag-and-drop your design image file over the upload button on the left. Simple, wasn't it? 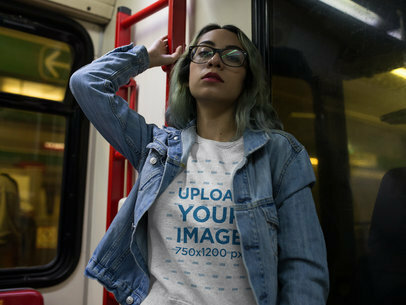 Try another T-Shirt Mockup! 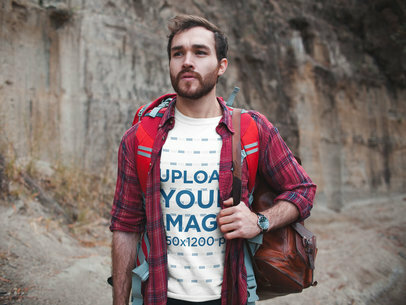 Use this beautiful visual asset featuring a man exploring a canyon wearing a t-shirt and a backpack, it's a great choice if you want to market your latest tshirt design in a more beautiful way! You just have to choose a color for the garment with the HEX tool on the right side of the page, then drag-and-drop your design image file over the upload button on the left. 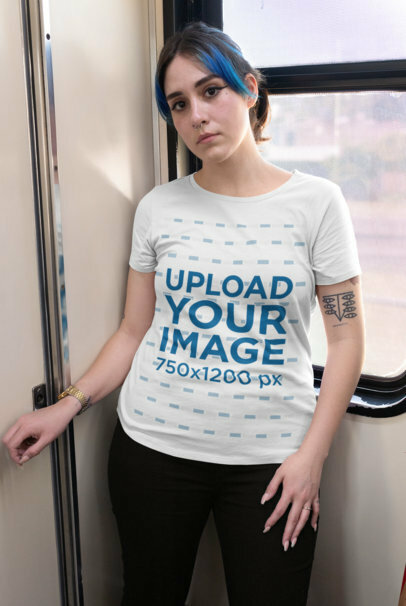 Try another T-Shirt Mockup! 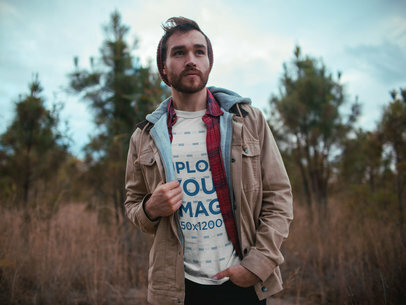 Use now this awesome visual asset featuring a dude with beard wearing a tshirt while observing the landscape outdoors and make your revenue grow with beautiful visual assets! 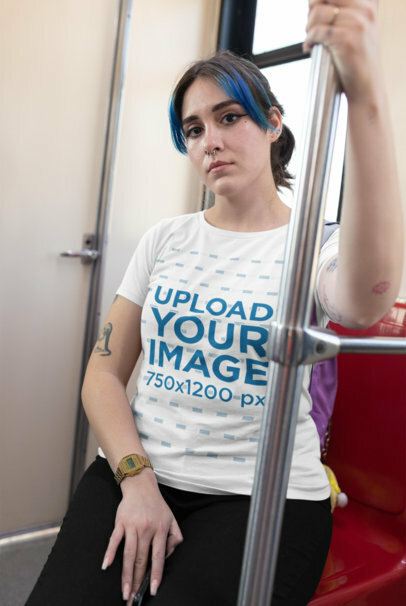 Use the HEX tool on the right side of the page to choose a color for this man's tshirt, then drag-and-drop your design image file over the upload button on the left. Try another T-Shirt Mockup! 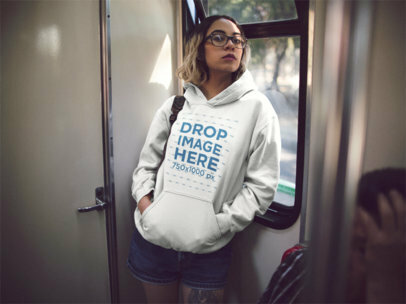 Use this beautiful girl's mockup wearing a pullover hoodie while sitting in the metro, it's a great option for you to showcase your latest designs for hoodies in a beautiful and realistic way! You just have to choose a color for the garment with the HEX tool on the right, then drag-and-drop your design image file over the upload button on the left. Simple, wasn't it? Try another Pullover Hoodie Mockup! 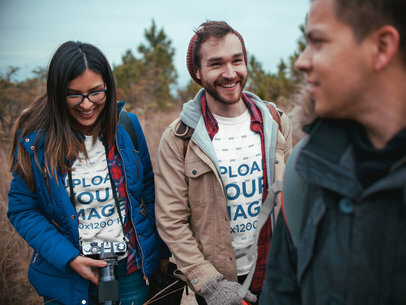 Use this excellent mockup featuring a man and woman wearing t-shirts while holding a camera outdoors and promote your latest designs for round neck tees in a more beautiful way! 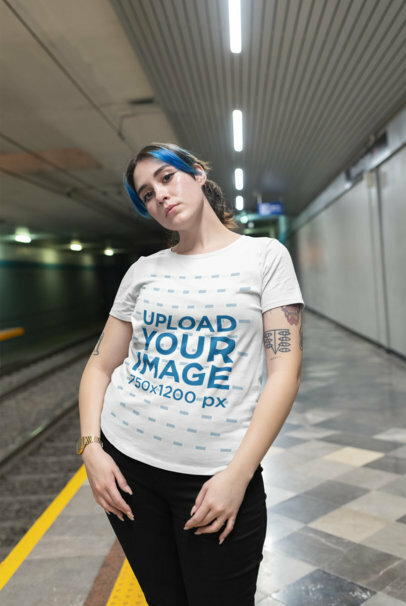 You just have to choose a color for each tshirt with the HEX tools on the right side of the page, then drag-and-drop each design image file over the upload buttons on the left. 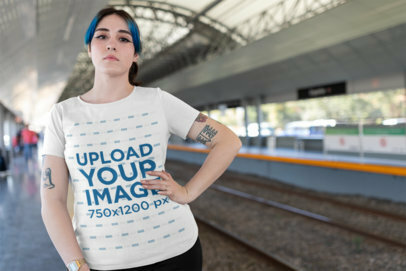 Try another T-Shirt Mockup! 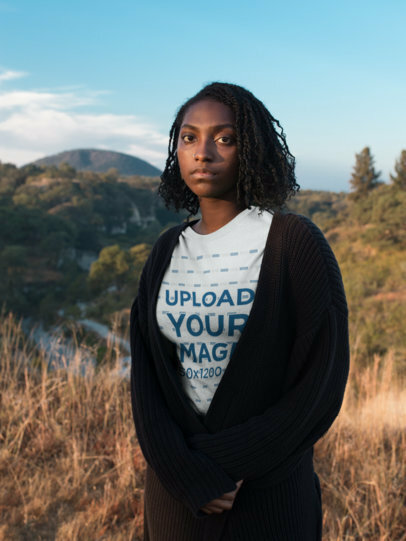 Use this awesome mockup featuring a black girl wearing a tshirt while taking a trip to the mountains, it's a great visual that you should use to promote your latest designs in a better way! 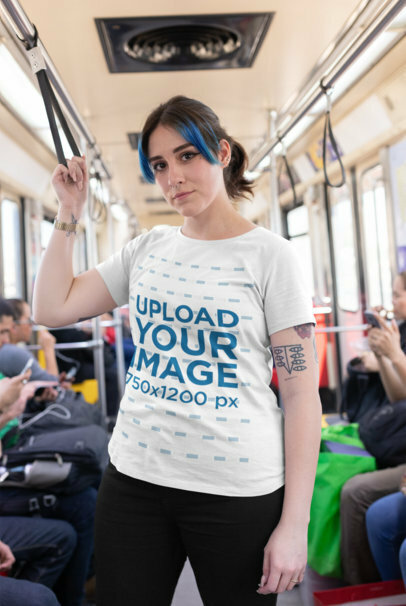 Start now by choosing a color for the tee with the HEX tool on the right, then use the upload button on the left to put your design on the tee. Simple, wasn't it? Try another T-Shirt Mockup! 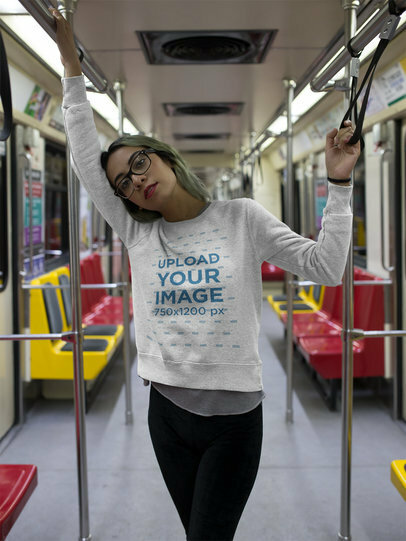 Use this awesome template featuring an edgy girl wearing a crew neck sweatshirt and promote your latest designs for sweaters in a better way! You just have to choose a color for the sweater with the HEX tool on the right, then drag-n-drop your design image file over the upload button on the left. Simple, wasn't it? Use Placeit and make your revenue grow! Try another Crewneck Sweatshirt Template! 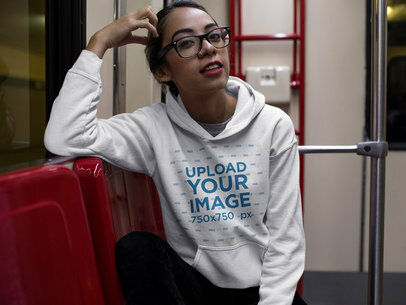 Use this awesome mockup featuring a girl wearing a crew neck sweatshirt while hanging around in an empty metro and make your audience feel more related to your designs! You just have to choose a color for her sweatshirt using the HEX tool on the right, then drag-and-drop your design image file over the upload button on the left. Simple, wasn't it? Use Placeit and market your design with realistic visuals! Try another Crewneck Sweatshirt Template! Use this beautiful mockup featuring a space gray iPhone X and showcase your latest app or responsive website in a more beautiful and realistic way! Use the Screenshot from URL to capture a website's screenshot or just drag n' drop your jpeg or png image file over the interface. Simple, wasn't it? Use Placeit and promote your app in a better way! Try another iPhone Mockup! 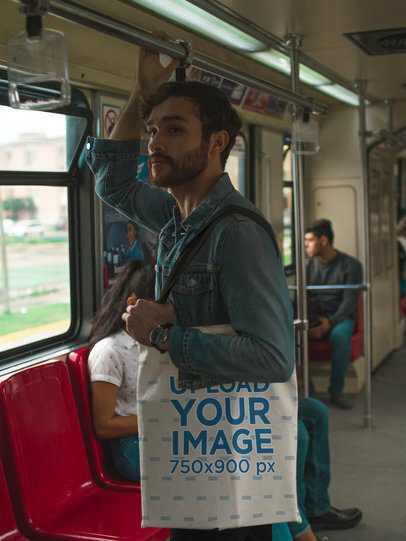 Take a look at this gorgeous visual featuring a man carrying a tote bag in a subway station, it's a great visual that you can use to showcase your latest urban design for a tote bag in a more realistic way. 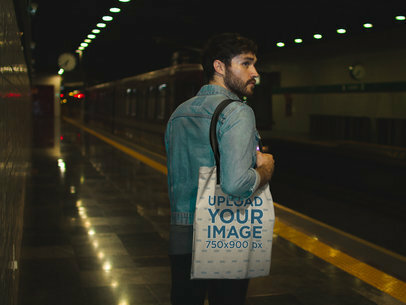 Start by choosing the tote bag and handle color using the HEX tool on the right, then drag-and-drop your jpeg or png image file over the upload button on the left. Try another Tote Bag Mockup! Take a look at this amazing iPhone X mockup featuring a girl holding an iPhone X against the beach, you can start promoting your app or responsive website in a better way! Start now, all you have to do is drag-and-drop your screenshot image file over the interface, or use the Screenshot from URL button to capture a screenshot from your responsive website. Easy, wasn't it? Try another iPhone X Mockup! 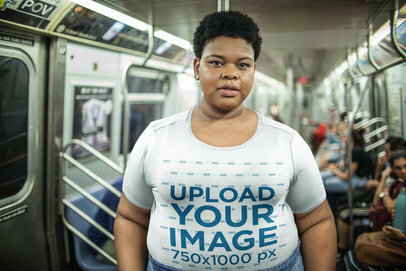 Check out this awesome mockup of a young hipster girl wearing a pullover hoodie while in the subway, it's awesome! All you have to do is drag-and-drop your image design on the interface, we will merge it for you in just seconds. That's right, you won't even have to use Photoshop. Start using Placeit to have beautiful images with photorealistic environments, that will show your customers how your designs look like in real life. Try another Pullover Hoodie Mockup here! Choose this Placeit stock photo mockup and get you app/website the attention it deserves! This iPhone mockup features a young smiling woman holding her white iPhone 6 in a portrait position. She is lying on a hammock at the beach. The ocean and the light give a peaceful, relaxed vibe to the image. The background is blurry, allowing consumers to focus their attention on the phone's screen in the woman's hand. It doesn't really matter what kind of app you've created, this scenario could really work out with almost any app or website of your choice. To use this mockup, just drag and drop your desired screenshot onto the iPhone's screen in the template or import a screenshot from a URL by clicking the "Grab Screenshot From URL" button and type in the URL so Placeit can do the rest for you. Make an impact on your consumers by making Placeit part of your new visual marketing strategy today! See more Device Mockups here! This iPhone 6 mockup template will be a key element of your iOS app marketing campaign. 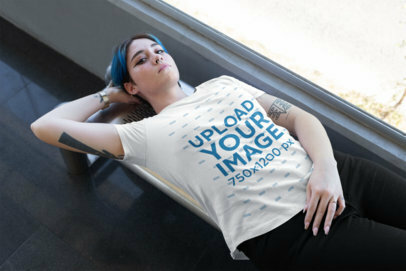 The stock photo template features a young woman relaxing at the beach while using her white iPhone 6 in a portrait position. She could be using your app on this relaxing vacation scene, go ahead and use this iPhone 6 mockup right away to enhance your visual content in seconds. Let the bright sky and clear blue ocean show your app to potential customers. Just drag and drop a screenshot of your app straight into the iPhone 6 and Placeit will adjust it for you. This iPhone mockup featuring a pretty girl by the pool could be the perfect way for you to display your new travel app's features and design, so why not customize right away? To customize this iPhone mockup just upload an image of your app or website onto the device on the template and Placeit will handle the rest of the work for you. Pretty easy right? It's time for you to stop wasting time on outdated marketing tools and begin using Placeit's mockups now! This iPhone mockup featuring a young woman using her iPhone 6s by the pool is a great context in which you can promote your latest iOS app, especially if it's a social or traveling app. 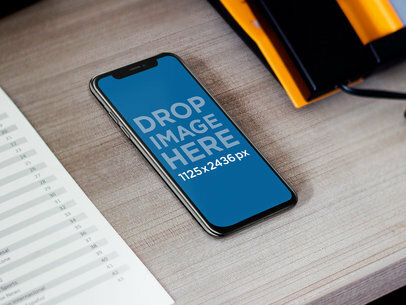 Use this mockup template right away by typing a URL or uploading an iPhone screenshot, it will only take a couple of seconds! To see another iPhone Mockup click here! Did you know that an attractive visual marketing strategy can launch or increase sales substantially for a business? If you do, then it might be time for you to update your old marketing strategy and make Placeit stock photo mockups part of your new one right away. Placeit real-life scenario images will allow you to publicize your new iOS app or website in a relatable way to prospective consumers, making it more desirable to them and at the same time easier for your product to achieve success. Photo mockup are really easy to use, all you need to do is upload a screenshot of your new iOS app onto the template, or input the URL so Placeit can do it for you. 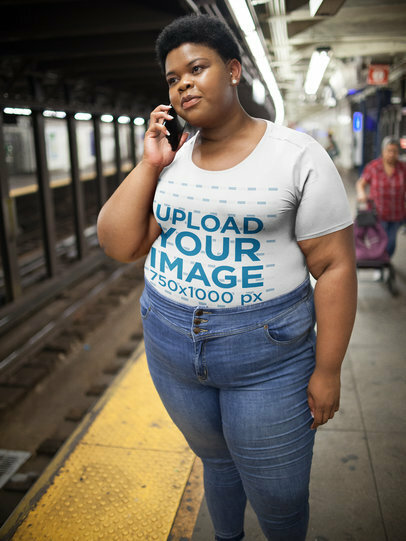 Costume your own mockup today and boost your visual marketing campaign immediately! This iPhone stock photo features a young woman at the pool using her white iPhone 6 in an angled portrait position.